The Council on Accreditation’s (COA) Child & Youth Development Accreditation includes early childhood education, after school, and youth development programs and organizations and the benefits of accreditation are many. COA offers two types of accreditation for child and youth development. Programmatic Accreditation: Each program (site) is reviewed and accredited independently of other programs and its parent organization. Organizational Accreditation: The organization as a whole is reviewed and accredited. The review includes a percentage of the programs that the organization operates in the site visit. Need more information about COA Accreditation? This 35 minute self-paced training is a great way to learn about the Council on Accreditation, the accreditation process, COA’s Standards, and how to begin your path to becoming accredited. 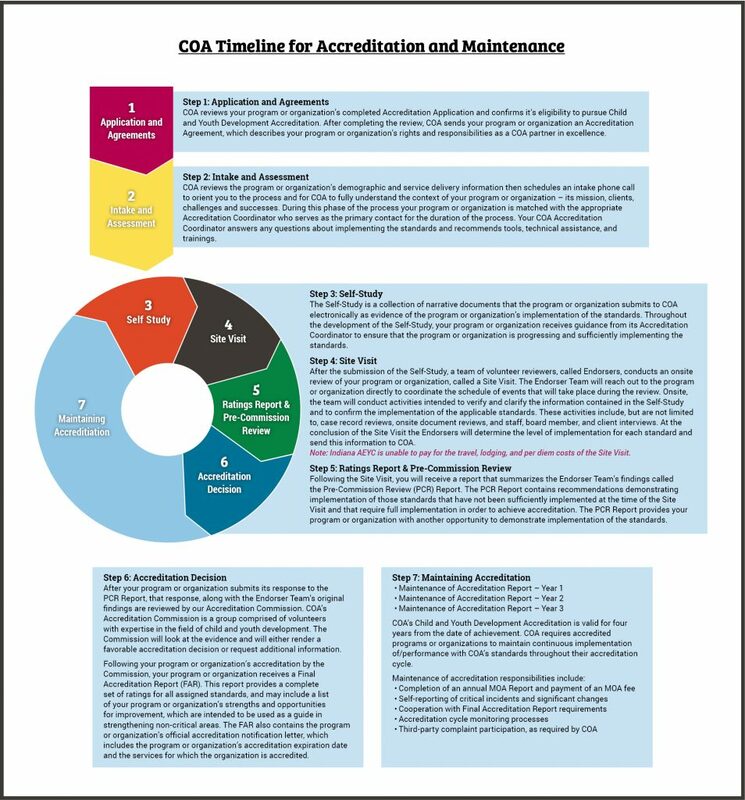 Even if you are already accredited, this can be a great resource for your staff to help them understand COA Accreditation. The Accreditation Work Plan Template created by COA can be used as a model work plan and modified to suit your program’s needs. It details specific important tasks within each step of the accreditation process, allows you to identify the person responsible for completing the task, has room to add notes regarding progress of issues, and defines a time frame for completion. Learn how to create an Accreditation Work Plan using this video created by COA! The Accreditation Learning Plan provides hyperlinks to recommended self-paced trainings and tools to assist you and your organization in learning the fundamentals of the accreditation process, COA standards, and how to use the MyCOA Portal. These resources are highly recommended and organizations that take advantage of them are likely to experience a more positive and productive accreditation process. Although this document lists the recommended order and accreditation phase within which you and your accreditation team should review each resource, all the hyperlinks are active and can be clicked on at any time. We will periodically send you reminders about these resources, depending on where you are in the accreditation process. A few things to highlight in the chart below: In the case of self-paced trainings, the estimated length of time it will take to view the course is listed. The column “Who is Assigned” provides space for you to list which staff member(s) are responsible for reviewing the recommended resource. The column “Date Taken” can be used to document when a resource has been utilized. If you have any questions, please open a case in your portal using the process outlined in the “MyCOA: Contact COA and Cases Overview” self-paced training listed below. through the MyCOA Portal, you will have an Intake Call. hour live webinar overview of the MyCOA Portal.